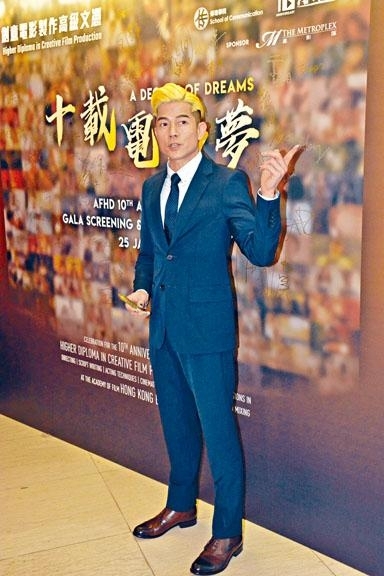 Aaron Kwok Fu Sing two nights attended the DECADE OF DREAM screening as a guest. Liu Kai Chi received the Hong Kong Baptist University film academy "outstanding contribution award". Sing Sing congratulated Uncle Chi on his award and said that Uncle Chi as an instructor at the school has helped many young people with intention to become film workers. He was well worth the honor, but Uncle Chi said that he did not live up to the honor and felt guilty. He even revealed that for now he had no plan to teach full time. In addition, Sing Sing's wife Moka Fang was said to be too light for her pregnancy, Sing Sing hoped that his wife would eat more. The most important would be the health of the baby. Would he be interested in becoming a guest instructor at the academy? Sing Sing said that he would be fine if the opportunity arose, as he would share what he learned from film with the new generation. Sing Sing with PROJECT GUTENBERG (MO SEUNG) would compete for the Asian Film Award Best Actor. He said that he was already very happy with the nomination. He has only seen Xu Zheng in DYING TO SURVIVE among the competition. "I am not on the jury, but the nomination is already a great encouragement. The award would be a bonus." The "outstanding contribution award" recipient Uncle Chi humbly said that he was a little guilt because he felt that he came up short educating wise. Now he was teaching as he learned, during the teaching process he saw his own shortcoming, but whenever he saw his students perform he would feel comforted. Uncle Chi said that he had no plan to teach full time, for now he would maintain teaching two periods a week. 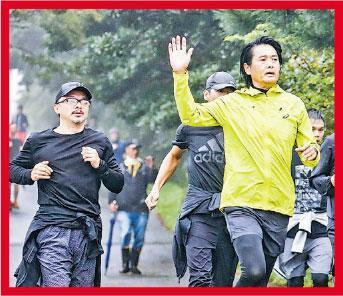 Busy with an inspirational film with Chow Yun Fat, Uncle Chi revealed that every morning he ran with Fat Gor to get into shape. He said that Alex Fong Chung Shun erupted in foul language because he could not catch up to Fat Gor's speed. Uncle Chi said, "I have no expectation of myself, from running I can see that my persistence is my advantage. Fat Gor have such long legs and full of running experience, he planned the running route and everyone had a very good time running."